I’m all for the nerd hero–the bland, retreating wallflower who blossoms late and great in his heroic journey. She can enthrall us if a) she grows up in some way and b) her compadres along the way are loud, unique, and full of quirks. We’ll keep reading so we can see his next choice and his friends’ next oddball move. Just beware those quirks don’t create…jerks. 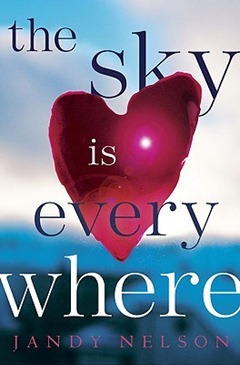 I had great hopes for The Sky is Everywhere by Jandy Nelson. I picked up this award-winning YA novel with its nerd hero expecting a lot. But less than halfway through, I put it down after three failed attempts to restart. The problem for me? The eccentric characters boasted way too many oddities for me to relate. Nerd heroine Lennie lives with a sage-waving grandmother who paints only in shades of green and thinks the state of Len’s soul is symbolized by the health of a house plant. Len’s uncle thinks he can resurrect bugs by building pyramids (to be honest, I couldn’t quite keep track of his theory, which I guess is the point, but it was obscure and strange enough to the point of being a bit creepy and repulsive). Then there’s the new guy from France with a rock-star smile who falls for Len and embraces her eccentric family without question. Mom and Dad are MIA, no surprise, as we see in many YA novels. Never mind the suitor’s angelic patience while chasing Len, who rebuffs him every time (up to the part where I stopped). The most interesting plot element, Len’s affair with her deceased sister’s boyfriend, is overshadowed by this circus cast of characters. There are beautiful lines in this novel and the prose is definitely worth the read–rich with imagery, compelling metaphor, strong voice. Blogger Casey McCormick offers an excellent tribute, and I share it here because I want to be clear that like desserts, wines, and meats, there are definite, inscrutable, and equal preferences when it comes to critiques. In other words, as someone once said when I was dumped by a boyfriend: There’s no accounting for taste. (How nice he thought the boyfriend made a mistake!) Clearly, McCormick loves this kind of a supporting cast and just because I find the characters annoying does not mean that in some universal sense, they should be ignored. I get the fan devotion and am struggling to discover why I can’t belong to this group. I take another look, a man-in-the-mirror gaze, at what made me close this book. Yes, my own novel is full of oddballs: a teen girl who worships Michael Jackson (prays, invokes, petitions him like a Catholic saint); a hippie mom with money lust (who celebrates Winter Solstice, Kwanzaa, or whatever holiday comes across her path with the exception of anything Christian); and a grandma who’s a faithful Mass attendee while cussing like a sailor. Yup, my peeps are weird. Yet in a given scene, I believe they do say enough standard, mainstream, expected things to give a reader something to cling to. They’re not flying so far off the radar they lose contact. I also think Nelson’s quirky characters mask the lack of a hero’s quest, otherwise known as the protagonist’s goal. I get that Len suffers great grief at the loss of her sister, but for the first half of the book, she is merely buffeted by the latest strange choice by her supporting cast. She’s busy reacting rather than making any strides of her own. That’s the nature of grief, so I’m not questioning the realism of what Nelson portrays here. However, back to taste: what I want from literature is a hero’s journey with a target. Even if the protagonist doesn’t quite know her mission yet, I don’t want her passively waiting or dodging; I want her choosing. Many of us would have abandoned Star Wars early on in 1977 if Luke Skywalker had spent too many scenes mourning his aunt and uncle’s loss. The fact he goes off to war sooner rather than later makes us want to follow. It doesn’t have to be battle; little actions can sometimes be enough, and Miles Halter of Looking for Alaska seeks after two obsessions: famous last words and a wild girl, Alaska. Both desires fuel his everyday, tiny choices. In The Sky is Everywhere, I’m not sure what Len wants except for her sister to come back, and as she avoids the help and concern of her family, her best friend, and various suitors, one starts to wonder, Would I leave her alone if I were her friend? I just might. Another reason I put the book down. Miles, despite his minor life, made enough small choices to be the tail of the comet that we followed his trail of light. Some may argue that Len’s choice of her sister’s boyfriend, that inexplicable lust, is enough to keep their interest and moves the story forward. Again, this is where tastes diverge and I can’t quite pin why that desire didn’t keep me riveted. Perhaps it’s an overall approach to characterization: if a character doesn’t choose much, then nothing much is at stake. If she is simply the eye of the storm while others swirl around her, there’s no contrast or foil. It helps when a character has contrasts, something to lose, and is foiled at every turn. It’s also helpful if the driving desire is nameable, less force of nature than an act of will. Len’s desire for her sister’s boyfriend feels like fate without free will; it’s as if a tornado blasted her into the arms of this boy. However, even the pallid characters of Alice Munro’s teen in “Red Dress–1946” or Beverly Cleary’s Fifteen make distinct choices they can discern and cannot argue are acts of God. This matter of “what’s at stake” may be why I raced right through Please Ignore Vera Dietz by A.S. King despite a raging flu. It’s a valid book to compare with The Sky is Everywhere because both books deal with loss and death. Vera is also surrounded by oddballs–her deceased best friend, Charlie, who still haunts her and “made inner conflict look delicious”; and her workaholic dad who doesn’t get that Vera is still in school and might not need over 20 hours of work a week, but,”no matter the ailment, he will suggest working as a cure.” There’s her pizza delivery boss, Marie, a “really cool biker lady with crooked yellow teeth.” Don’t forget a mother on the lam who became a stripper (Cindy/Sindy) and then ran away with a podiatrist. There’s even a talking pagoda–an odd architectural feature in this town that gets to sound off every once in a while. I’d say this is enough of a freak landscape to satisfy anyone with a taste for weird. 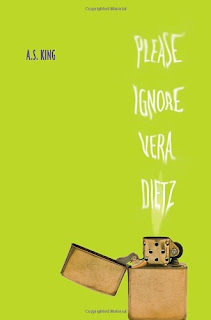 Here lie my reasons why we shouldn’t ignore Vera Dietz. Where Vera veers off the passive, wallflower nerd trail (she’s obsessed with words and a strong student, like so many other YA heroes) is with her choices. She says she chooses not to be either of her parents. She makes the pizza job her own with a plan to pay for her community college future so she won’t be crushed by student loans. In the course of that gig, she must brave some strange houses. This is a heroine quality of courage we like to track. She also chooses to drink a little too much, and she chooses to have a crush on a 23 year-old. In other words, she makes some key mistakes based in real, out-there action. From the very first page, we know her inner conflict–loving and hating Charlie, the best friend/love of her life who just died. She’s a prisoner of horrible, obsessive questions(see the preface quotation) from the start, on page one. This gets readers running right behind her. Vera makes bad choices. She doesn’t just wallow. Therefore the quirky folk around her don’t become jerks by overwhelming her. Len’s grandma, uncle, and wannabe boyfriend are so larger-than-life, they upstage. I take comfort that my Wacko Wendy tends to upstage others when she walks into a room. But my advice to Len’s heroine’s journey is good advice for my writing as I revise any character’s trail. Is she blazing it, or is it a mere side trail of thoughts and wishes? What action will my characters take by the close of this scene? — What is “quirky”? Define it by comparing quirks to what you consider normal, status quo, expected traits of people in your world. — Who’s your favorite quirky character in literature or film? Explain why the quirks work for you. — How are these quirks a cover for the character’s original wound? What hurt your character as a child that now expresses itself in weirdness? — How are these quirks an expression of the character’s essence–personality, interests, spirit? — What novel or story or movie have you abandoned because the quirkiness got too strange to follow? What alienated or frustrated you? — How quirky are your characters in your WIP? On a scale of 1 to 10, 1 being “lemming and trend follower” and 10 being “freakazoid,” where do your protagonist and supporting cast rank? — What quirks of others (real folk) irritate you to the point of leaving the scene? What quirks of yours irritate others? — What are your writing quirks? How do these quirks express themselves in writing tics, blind spots, redundancies, blocks? What parts of the writing process are your biggest challenge? — Are your characters making choices in the first ten scenes of your novel, or, are they merely thinking about making choices while other characters get to make the really interesting ones? — Are you a nerd who tends to be upstaged by others’ quirks, but you’re brilliant at writing about them? If you’re a spectator-type of author, analyze how your nerdiness expresses itself. Are you hyperanalytical, perfectionistic, wallowing, highly observant, critical, and sometimes paralyzed in the face of larger-than-life personalities? — Do you ever feel that others are too busy living while you’re too busy chronicling their odd escapades? Is everybody’s truth stranger than fiction–and yet your fiction is stranger than your life? I think your instincts are right with this. Nerds seem to struggle to balance individuality with “the crowd,” and if a writer makes them seem odd ducks for the sake of being odd, then these characters will probably come off as either posturing or demonstrably superficial.